Assembled apparatus for transtracheal jet ventilation using an oxygen E-cylinder. I have an important airway safety issue, and thus would appreciate your opinion. Currently at my hospital our hand-held jet ventilators for emergency transtracheal jet ventilation (TTJV) are attached to E-size oxygen cylinders on our difficult airway carts. Their lack of a quick connect/disconnect system does not allow one to rapidly change the cylinder when it becomes empty. These are the only designated sources of oxygen for TTJV in our operating room suite. I have been trying to convince my hospital that a system allowing rapid attachment of a hand held jet ventilator to a central oxygen source is essential to insure uninterrupted oxygen supply during this most critical time. However, I continue to meet resistance, and thus, would appreciate your response. I would also like to suggest that the APSF forward this topic to the ASA Difficult Airway Task Force for their response. Should this become a standard of care, or should each institution continue to employ whatever system they so desire? Some strong direction from our society would be very helpful to improve patient safety, and also to assist all of us who spend time teaching this technique at our institutions and at various meetings throughout the year. Thank you in advance for addressing my inquiry. P.S. 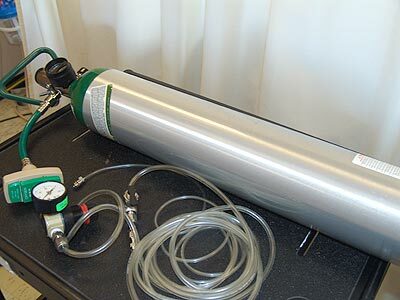 How long would it typically take for a full E-size oxygen cylinder to become empty when using it with an attached hand-held jet ventilator for emergency TTJV? Your request seems quite reasonable. It would assure a more reliable, longer-lasting source of oxygen (assuming no central gas failure) and is not very expensive to implement. Dr. Jon Benumof at UCSD insisted on this arrangement in all of the ORs there, and they could provide you with implementation details if you needed them. One advantage of having your TTJV on the difficult airway cart is its availability for use in out-of-OR locations like PACU. One solution for your issue would be to put a Y-connector on the central oxygen line coming into your anesthesia machine with a quick connect (female) on the end of the extra line. A similar quick connect could also be placed on the airway cart E-cylinder source. The jet ventilation systems (which could then be fewer than one for every room IF you have reliable technician support) could then have the same (male) quick connect to allow rapid installation at any OR site or on the airway cart for out-of-OR use. We have essentially the same system at the University of Washington Medical Center and it has served us well. I agree with the above comments and suggestions. At our institution, however, we have had dedicated jet ventilators for each anesthetizing location, but have had the luxury of an extra oxygen outlet on those columns. The Y-splitter sounds like a reasonable solution for both the OR outlet and the E-cylinder, if you don’t have that extra outlet. If your institution does not want to purchase these inexpensive quick connect fittings for each site, then your portable system might require a second E-cylinder of oxygen for back-up. This expense would seem better utilized on the connectors, however. Your question has even prompted me to check that we have a portable device for off-site locations. I will forward this exchange to the ASA Difficult Airway Task Force for possible future comment or action. The duration of supply oxygen from the full E-cylinder is simply 660 liters divided by the flow rate emanating from your particular TTJV orifice, at the specified regulator pressure. I don’t know what those data are. Perhaps your supplier could provide that information. If one chooses to use the splitter from the wall supply, one would have to assure that connecting 2 medical devices (e.g., the anesthesia machine and a jet ventilator) would not generate any back pressure or pressure reduction issues if both were drawing gas at the same time. It is unlikely, but should be assessed under various conditions. Also, for facilities with potentially limited resources and fewer jet ventilation setups, it makes sense to have jet ventilation capability travel with the emergency airway cart, as you describe. In the years from 1996 to 2003 I documented 3 oxygen pipeline failures in a single academic medical center. These were not failures of the liquid oxygen source that affected the entire hospital, but were local phenomena that affected a single operating room. The causes of these failures were pipeline debris that clogged the wall/column connectors and stopped the flow of oxygen to the anesthesia machines. I suspect that these events are much more common than true failures of the oxygen supply at the source or further upstream. Now when I consult on the design of operating rooms I always specify 2 gas connectors for each gas being delivered to a column, ceiling drop, or wall cluster. This provides a reliable secondary source of gas in the event that one connector becomes clogged from pipeline debris. In each of the 3 cases that I mentioned, a second oxygen connector was available; changing the oxygen hose to the anesthesia machine from one Diamond connector to the other solved the immediate problem. Engineering had to replace the clogged connector. We had jet ventilators in each ENT room and on each difficult airway cart. I would suggest that manual TTJ ventilators are cheap and could be placed in each anesthetizing location with enough hose to connect to the secondary oxygen outlet. If there is concern about a total oxygen system failure, a single cheap adapter hose could be constructed (e.g., oxygen DISS to female Diamond) and kept in the drawer with the manual TTJ system, so that the TTJ ventilator could be connected to an emergency O2 tank. The difficult airway carts clearly need an O2 tank and their own manual TTJ ventilator as you describe. My main concern is that we recognize the need for a secondary oxygen outlet and a secondary air connector at each column, ceiling drop, or wall cluster. I wish to thank Dr. Lorri Lee, a member of the APSF Newsletter editorial board, for pointing out that TTJV has the potential for high risk of barotrauma. In the ASA Closed Claims paper on the Management of the Difficult Airway (Peterson et al., Anesthesiology 2005;103:33-39), 8 of 9 patients who had TTJV used for a rescue technique for airway emergency developed barotrauma with poor outcome.